It's been tough to blog lately, I've had a ton of "real-non-beer-job" year-end stuff to deal with, but I recently purchased the collaborative brew from Nøgne Ø / Jolly Pumpkin / Stone. This seemed quite different from what I remember of the 2008 batch. This year's seemed to be more about the spices than anything else. It actually reminded me of one of our early (and terrible) homebrews where we through WAY too much spruce into a stout. I think that's why I didn't enjoy this one as much as the previous year. But it was still good! Go try it for yourself. Hopefully I'll cram in a post or two more before the new year, but in case I don't, thanks for following and here's to a craft beer filled 2010! Dogfish Head & BeerAdvocate Collaboration - Smoking the Malt! This is a cool little video from BA showing how they're smoking malt for their upcoming collaboration brew, exclusively available at Extreme Beer Fest in Boston, MA. A few weeks ago I had the pleasure of trying this offering from the great minds at Allagash Brewing Company. I would say that 90% of the time Allagash hits it out of the park, but I found this to be a SLIGHT misstep. Although, full disclosure: I had this entire 22oz bomber by myself, so it may have been a bit too much for just one mortal human. That aside, I found this Wild Ale to be a bit too bitterly sour, whereas something like Russian River's Consecration or the Ithaca Brute hits the sour level perfectly. Not the greatest drinkability here. A brief perusal on BeerAdvocate shows that some people seem to agree with me. But delving deeper, it seems the reviews for vintages of this are much better. Perhaps they switched something in their recipe this year and it didn't quite work as well? I don't believe I've ever had it before, so I can't compare. The week(s) from hell continues here in the non-beer-related work world. Forgive me. In the meantime, check out this video about beer made with barley grown in space! This guy is hilarious. He's really good at chugging beer and happens to also enjoy craft beer. He was our true inspiration in our Dogfish Head 120 Minute Chug Attempt. There I said it. I really feel that it has de-throned the mighty Blind Tiger. Of course, both spots suffer from getting absolutely PACKED, but Rattle is definitely bigger and more accommodating. Their selection is always top notch and the owner, Patrick, is friendly as hell and you can tell he really cares about quality beer. Last night they began their 1 year anniversary celebration with a Cask Festival. 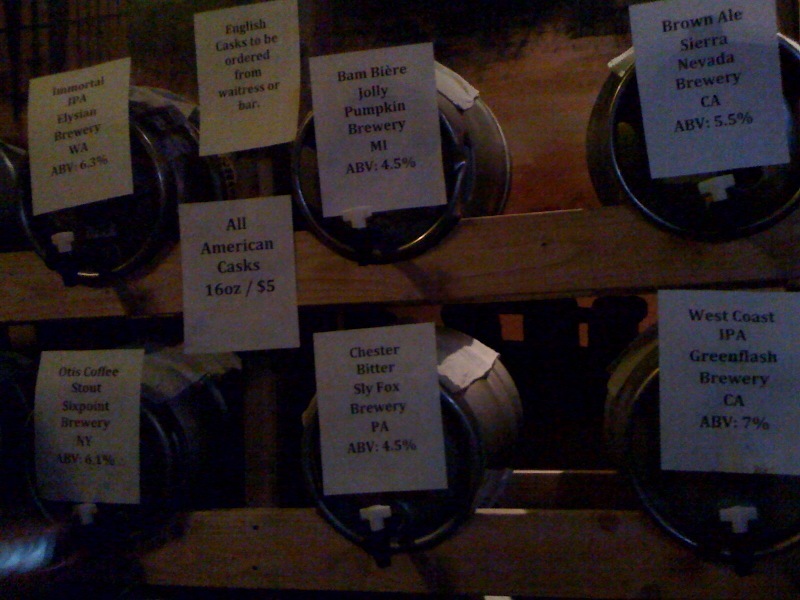 As you can see they had quite a few casks, and those were only the US ones! They still have a whole slew of UK casks in addition to those. 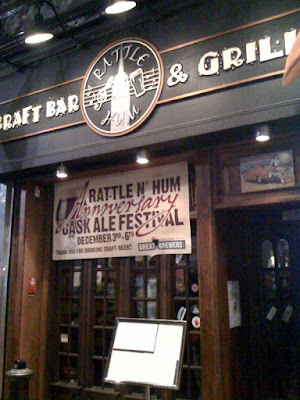 In short, GO TO RATTLE'N'HUM IF YOU VISIT NEW YORK CITY! I've been distracted by 3 nights of Phish at MSG this week, which explains why I've resorted to posting beer videos (although they are all awesome). Here's one more for you. Busy week. Here's some filler, take a virtual tour of Sierra Nevada with Mr. Ken Grossman! First up! Allagash Grand Cru paired with Thanksgiving Dinner. Turkey, Mashed Potatoes, Turnip, Sweet Potatoes, Stuffing, Green Beans and Corn! This was THE perfect pairing. The combination of the dryness of the turkey and the sweet malty goodness of Grand Cru. Next up was dessert! Great Divide Oak Aged Yeti Imperial Stout paired with Pumpkin and Apple Pie with a side of vanilla ice cream. Here's where my pairings derailed. When I went to the beer store to pick up these pairing beers, I had just read about how great the Oak Aged Yeti was and I was excited to try it. Well, I would advise that anyone looking for pairings with dessert, to avoid oak-aged beers. The whiskey/oak aged flavors overwhelmed the sweetness of the pies. This would have been perfect without the whiskey and oak flavors. The mouthfeel was spot on. A few nights later, two awesome things happened. First, I found 4 packs of Brooklyn Black Chocolate Stout for $5.79 each at The Cellar 32 in Brigantine, NJ. That is by far the cheapest I have ever seen it. I asked about cases but they didn't have any, so I just bought four 4 packs and went home very pleased. The second awesome thing was that my Mom surprised me with cake for my 28th birthday (12/1). Organic chocolate cake! First thought? Chocolate Cake + Chocolate Stout! This was an excellent pairing. Although I couldn't help but still desire a glass of milk on the side in addition. ©2011 beertography. Simple theme. Powered by Blogger.